St. Justin Popovich: . . . Hence, a division, a splitting up of the Church is ontologically and essentially impossible. 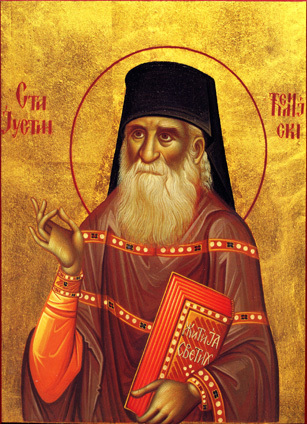 “Like the holy apostles, the holy fathers and the teachers of the Church confess the unity and uniqueness of the Orthodox Church with the divine wisdom of the cherubim and the zeal of the seraphim. Understandable, therefore, is the fiery zeal which animated the holy fathers of the Church in all cases of division and falling away and the stern attitude toward heresies and schisms. In that regard, the holy ecumenical and holy local councils are preeminently important. According to their spirit and attitude, wise in those things pertaining to Christ, the Church is not only one but also unique. Just as the Lord Christ cannot have several bodies, so He cannot have several Churches. According to her theanthropic nature, the Church is one and unique, just as Christ the God-man is one and unique. This entry was posted in Sayings from Saints, Elders, and Fathers, St. Justin Popovich and tagged Councils, Falling Away, False Ecumenism, Heresy, Heretic, Holy Fathers, One Church/Church Divisions, Schism, The Church on May 20, 2014 by . This entry was posted in Needs Source, Sayings from Saints, Elders, and Fathers, St. Mark of Ephesus and tagged Baptism, Chrismation, Defending Orthodoxy, Eucharist, False Ecumenism, Filioque, Heresy, Holy Tradition, Latins/Roman Catholics, Leavened Bread, Nicene Creed, Schism, The Great Schism, Unleavened Bread on May 19, 2014 by ocqadmin. 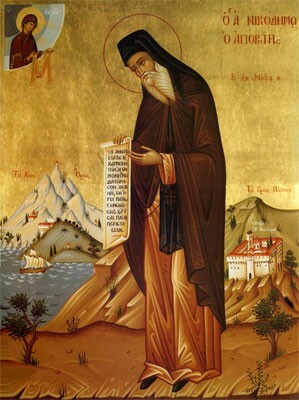 St. Nikodemos the Hagiorite: That the Latins are heretics there is no need of our producing any proof . . .
That the Latins are heretics there is no need of our producing any proof for the present. The very fact that we have entertained so much hatred and aversion against them for so many centuries is a plain proof that we loathe them as heretics, in the same way, that is to say, as we do Arians, or Sabellians, or Spirit denying and Spirit-defying Macedoniacs. . . . Enough was said concerning them by St. Mark of Ephesus in Florence (at the twenty-fifth general assembly), who spoke frankly as follows: We have split ourselves off from the Latins for no other reason than the fact that they are not only schismatics but also heretics.” Wherefore we must not even think of uniting with them. This entry was posted in St. Nicodemus of the Holy Mountain and tagged False Ecumenism, Heretic, Latins/Roman Catholics, Schism, St. Mark of Ephesus, The Great Schism on May 15, 2014 by . The Holy Fathers must have known something for prohibiting the relationships with the heretics. Today they say: “we should pray together not only with a heretics but also with the Buddhist and with the fire worshiper and the demon worshiper. The Orthodox must also be present in common prayers and in their conferences. It is a presence.” What presence? They resolve everything with logic and justify the unjustifiable. The European mind believes that also the spiritual matters can also come into the Common Market. Some of the Orthodox who are shallow and wish to make a promotion, “a mission,” they arrange conferences with the heterodox to cause a sensation, believing this way that they promote Orthodoxy, by becoming so to speak “Hungarian goulash” with the false believers. Then the super-zealots take hold of the other end; they also blaspheme against the Mysteries of the New-calendarists, etc. and deeply scandalize the souls who have piety and Orthodox sensitivity. Publication: Holy Hysichastirion of Evangelist John the Theologian by Souroti, Thessaloniki. This entry was posted in St. Paisios of Mount Athos and tagged Defending Orthodoxy, Dogma, False Ecumenism, Heresy, Heretic, Heterodox, Holy Fathers, Humanism, Logic/Logical Mind & Thinking, New Calendar, One World Religon, Orthodox Faith, Prayer, Praying with Heretics/Heterodox, Scandal, Schism, St. Gregory of Palamas, St. Mark of Ephesus, The Church, Western on April 29, 2014 by . In vain do some of the Orthodox marvel at the current propaganda of the Roman Church, at the feigned selflessness and activity of her missionaries and at the zeal of the Latin sisters of mercy, and incorrectly ascribe to the Latin Church such importance, as if by her apostasy from the Orthodox Church, the latter remained longer such, and has the necessity to seek unification with the former. On rigorous examination, this opinion proves to be false; and the energetic Latin activity not only does not evoke surprise, but, on the contrary, arouses deep sorrow in the hearts of right-thinking people, who understand the truth. 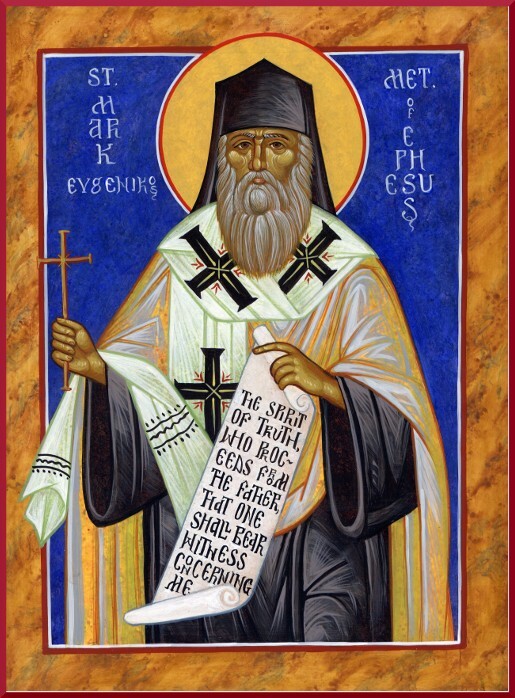 This entry was posted in St. Ambrose of Optina and tagged Clergy, Correct Faith, Councils, Defending Orthodoxy, False Ecumenism, Filioque, Heresy, Heretic, Heterodox, Holy Fathers, Holy Tradition, Innovation, Latins/Roman Catholics, Nicene Creed, Orthodox Faith, Quotes of the Optina Elders, Schism, St. Basil the Great, The Great Schism on August 30, 2013 by . St. Mark of Ephesus: The Latins are not only schismatics but heretics . . . This entry was posted in Sayings from Saints, Elders, and Fathers, St. Mark of Ephesus and tagged Defending Orthodoxy, Filioque, Heresy, Heretic, Latins/Roman Catholics, Orthodox Faith, Schism on August 25, 2013 by . St. Gregory the Great: It is better that scandals arise . . . This entry was posted in Sayings from Saints, Elders, and Fathers, St. Gregory the Great and tagged Defending Orthodoxy, Heresy, Orthodox Faith, Schism, Truth on August 7, 2013 by . St. Mark of Ephesus: We seek and pray for our return . . . This entry was posted in Needs Source, Sayings from Saints, Elders, and Fathers, St. Mark of Ephesus and tagged Heresy, Heretic, Latins/Roman Catholics, Schism, The Great Schism on August 7, 2013 by ocqadmin. St. Mark of Ephesus: It is impossible to recall peace . . . This entry was posted in Needs Source, Sayings from Saints, Elders, and Fathers, St. Mark of Ephesus and tagged Defending Orthodoxy, False Ecumenism, Heresy, Heretic, Infallibility of the Pope, Pope, Schism, The Great Schism on August 7, 2013 by ocqadmin.